After an incredible “mountain top” experience on Mount Sinai with a 40-day visitation, receiving The Ten Commandments, and having God inscribe the Law on his heart, Moses descended the mountain and was hit with heavy spiritual warfare. His people were entangled in blatant sexual perversion as they worshipped a golden calf. The Lord’s jealousy burned and He released judgment, costing three thousand men their lives. In total desperation, Moses cried out for a greater encounter with the Lord – a deeper visitation was needed! It was not enough to see a burning bush ablaze, or watch the Red Sea part, or even to see supernatural provision each day with the raining down of manna. He cried out for more! He wanted to see God’s face. He would not take “No” for an answer. Total desperation, unquenchable hunger, and unswerving commitment to his people caused Moses to contend with God for His presence. While Moses faced death and warfare, it caused him to press into God with a greater desperation! Do your trials cause you to run to God or from God? No matter what your circumstances, God is inviting you to come up higher. Don’t live in the valley of death and destroyed dreams. He will give you the strength and the wings of an eagle to soar up the mountain to greater heights in Him. God answered Moses’ cry by letting His goodness pass before him. After Moses descended, the very glory of God rested on him, causing his face to shine. Moses even had to wear a veil to hide the blinding brightness of God’s glory. Have you, like Moses, cried out to see the face of God? It is not enough to have a “mountain top” experience or receive fresh revelation as Moses did! Moses wanted more. He wanted friendship. He wanted intimacy. He wanted God Himself. There is something greater than receiving life-changing prophetic words, attending the latest of conferences or seeing God’s power explode in signs and wonders: Nothing is greater in this life than being His friend. Is there a cry in you for a deeper friendship with God? God is calling for us to meet with Him face-to-face. Prayer: Lord, the warfare has been so intense. In the storms of life, I want to run to you and not from you. What I have had before is just not enough. I need to see You face-to-face. I want to be Your friend and hear Your heart. Please encounter me, Lord! The Beloved’s bride – eager to be with the One she loves – rushes up the stairs to meet Him, leaving the world and all her cares behind (just as His disciples did – Matthew 4:19). She is encircled in a rainbow, signifying the promises of God (Genesis 9:13). 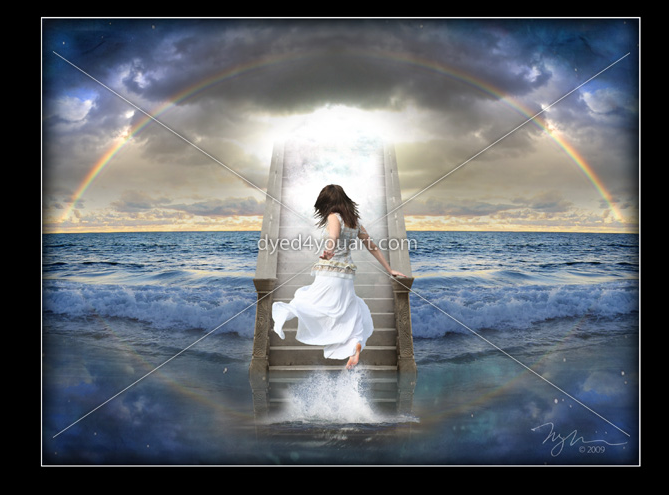 Waters of life rush down from heaven – as if the Beloved Himself is rushing to meet her. The scripture that goes with this scarf is from Amos 3:7, “Surely the Lord God will do nothing without revealing His secret to His servants the prophets.” The meaning of the original words imply a close intimacy – that of two close friends sharing a quiet moment together on a couch. I pray that you would run to meet the Beloved, be swept up in His water of life, and be fascinated by the revelation of His mysteries.